When your sectional starts to look dated, you can slipcover it rather than spend a lot of money on a new sofa. Premade slipcovers don't always fit sectionals perfectly, so you may want to make a no-sew slipcover instead. 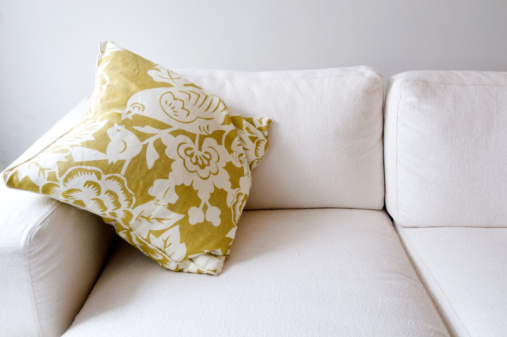 With just a few supplies, you'll have a customized slipcover that's a lot less than the price of a store-bought version. Inexpensive canvas-type painter's dropcloths work well for no-sew slipcovers and can give sectional sofas a shabby chic touch in a just few minutes' time. Painter's dropcloths reduce a slipcover's cost substantially -- at least in half, if not more -- when compared with yardage from the fabric store. Just be sure to choose a canvas-style dropcloth without plastic backing. You'll also want to get adhesive-backed hook-and-loop tape meant for fabric. This will hold together seams beneath cushions or other hidden places. Before you're ready to use the dropcloths as slipcovers, wash them to soften them up. If you don't like their tawny color, add bleach to the wash cycle to give them more of a light ecru linen look. Hang the canvas-type fabric on a clothesline to dry, or put it in the dryer. Line drying gives the fabric a fresher smell, but if it's somewhat stiff, you can soften it up by using the wrinkle-release setting on your dryer. This no-sew slipcover drapes completely over the entire sectional, cushions included. Measure the sectional lengthwise to know how many dropcloths you'll need. For example, a sectional that has a 6-foot section and a 7-foot section would require roughly two 9-by-12-foot dropcloths -- unless you plan on covering the cushions separately, then you'll need three. Arrange the dropcloths onto the sofa, draping them over the back and front, pulling them taut as you smooth them in place. If your couch is exposed from behind, leave enough fabric to hang down its back. Tuck the dropcloths into the crevices of the couch between the back and seat and the arm and seat, rearranging the front, back and sides until you're satisfied with the look. Don't do any cutting yet, as you may need to rearrange the fabric multiple times. Pin any areas where you want to fold the fabric for a smooth appearance (around the arms, for example), as you will secure these areas later with hook-and-loop tape. Rearrange as necessary. Once you're satisfied with the look, cut away excess fabric from the front, back and sides, but leave enough to fold underneath the couch. Cut enough L-shaped drywall edging material to fit the length of the sofa between the cushions, as well as the back, arms and cushions. Push the L-shaped edging, with the open side facing you, into the crevice where the seats meet the back of the couch. Once hidden in place, the edging keeps the dropcloth slipcover from moving. Don't insert the edging into the sides yet. Fold, twist or miter the extra fabric at the arms, depending on the type of arms the sectional has, and tuck the extra fabric into the crevice before adding the L-shaped brackets. If you prefer a smoother look, smooth the fabric in front of the arms (folding it beneath any of the side fabric) and pin in place. Replace the pinned areas with hook-and-loop tape to keep the fabric smooth. Fold the raw edge of the dropcloth over the front, sides and back, stapling on the underside every 6 inches to keep the fabric taut. Complete the steps in the previous section with the cushions removed from the sectional. Lay the cushions on the dropcloths and cut the fabric so that you can fold the edges under the cushion. Secure the four cut edges of the fabric to the bottom side of the cushion with adhesive-backed hook-and-loop tape, folding the corners as needed. Repeat for all cushions on the couch. Set the cushions on the sectional with the slipcover already finished and on the couch. Add color-harmonized throw pillows to the couch. Approximately How Much Fabric Is Needed to Recover a Recliner?